Voir un extrait – Teaser. It is the most extreme adventure that Brittany surfers Aurélien Jacob, Ewen Le Goff and Ronan Gladu have lived. Equipped with « fat bike » in bamboo to travel, they explored the wild coast of Gabon for several weeks. 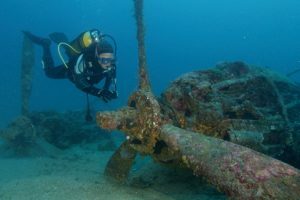 Their objective: to search for waves that have never been surfed and to meet the local populations. To achieve this, they had to learn to live with wild animals, acquire jungle survival techniques and always believe in their good luck, at all costs. Loïc Blaise mène une aventure très particulière. Pour lui, la maladie dégénérative dont il est atteint est à l’image du réchauffement climatique et de ses effets dans l’Arctique qui nous touchent tous. C’est donc un double défi contre la fatalité et l’inertie que le jeune pilote français entend relever en entreprenant le premier tour aérien du Cercle Arctique. Loïc part, au cœur du Grand Nord, pour un vol de 22 000 kilomètres et 50 étapes au profit de la lutte contre la sclérose en plaques. Loïc Blaise lives a very special adventure. For him the effects of the degenerative disease Multiple Sclerosis, that he is suffering from, mirror the impact of global warming especially on the Arctic – a destruction that finally affects us all. The young French pilot is therefore taking up a double challenge of fighting against fatality and inertia by undertaking the first aerial tour of the Arctic Circle. Loïc leaves, flying in the heart of the Far North, for a journey of 22 000 kilometers and 50 stages to gather funds for the fight against Multiple Sclerosis. The largest and yet unexplored fjord system in the world and home to a wide range of natural habitats, Scoresby Sund, on the east coast of Greenland, is a unique place to study the impacts of global warming. 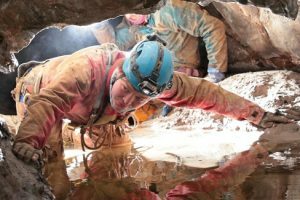 Last summer, eco-explorer Evrard Wendenbaum and his team of adventurers and scientists travelled there in order to testify to the beauty and fragility of this breath-taking region and to collect essential data for its preservation. 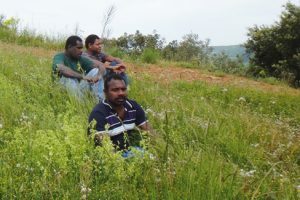 They are three Saa: Watas, Melsoul, Bebe of Pentecost Island, Vanuatu archipelago, where they still live in their traditional way. It was not so easy to organize their visit to France for five weeks of discoveries, they who do not have a civil status document ans even less a passport. The idea here is the inverted gaze, the way in which the « other » perceives us, the way he tells it. The way in which all get tied between two societies that everything separates a priori but which certain human relationships can gather. 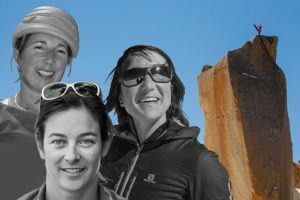 It is a documentary that explores the world of the mountain through the strength of women. There are three main subjects: Marion Poitevin, Liv Sansoz and Martina Cufar-Potard. Through interviews we discover what they share and also what separates them in their paths through life, but above all we discover the strength of woman in all its potential. A team of 40 explorers, french and chilean will set off to undertake one of the last geographic expeditions to be achieved on the marine isle of Madre de Dios, a true terra incognita located in the heart of Patagonia. To carry out this risky exploration in one of the most remote parts of the planet, speleogists geologists, botanists and biologists will have to face extreme conditions in this unexplored land to conduct a research programme aimed at becoming a UNESCO Wolrd heritage site. Par Christine Martin, adjointe au maire de Dijon, déléguée à la culture, à l’animation et aux festivals et Anne Quéméré, présidente du jury du film et Olivier Allard, délégué général de La Guilde et du festival. By Christine Martin, deputy in charge of the festivities of the city, of the festivals and of the attractive places of interest, Anne Quéméré, presidente of the film jury and Olivier Allard, CEO of La Guilde. Célèbre pour ses trois grands voyages, au Kirghizistan, en Chine et en Afghanistan, à une époque où franchir les frontières relevait de l’exploit, Ella Maillart fait partie des plus grandes aventurières du XXe siècle. Vingt ans après sa disparition, le film raconte la vie de cette pionnière qui a marqué l’histoire par ses voyages, ses récits et ses photographies. Choisir sa destinée, façonner sa vie en toute indépendance, quelles qu’en soient les difficultés, voilà l’enseignement laissé par Ella Maillart. 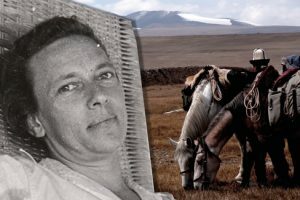 Ella Maillart is one of the 20th century’s greatest female adventurers, famous for her three great journeys across Kyrgyzstan, China and Afghanistan, at a time when crossing borders was a feat. Twenty years after her death, the film tells the life of this pioneer who marked history by her travels, stories and photographs. Choosing her own destiny, shaping her life with complete independence, whatever the difficulties encountered, here is the teaching left by Ella Maillart. 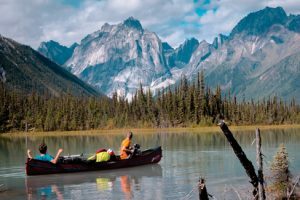 Olly Hicks et George Bullard, deux aventuriers des temps modernes, se lancent dans une expédition en kayak qui va les mener du Groenland jusqu’à l’Écosse dans le sillage des Finnmen. Ils vont parcourir 1 200 miles en six semaines et passer 12 nuits en mer en ramant à la lumière du soleil de minuit. Leur but ? Tenter de prouver que les Inuits ont bien entrepris ce voyage à bord de leurs embarcations en peaux au XVIIe siècle. 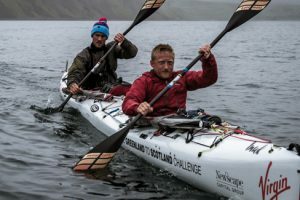 The story of an Inuit man who paddled 1,200 miles (1,932km) between Greenland and Scotland inspires Olly Hicks and George Bullard to duplicate the journey in a sea kayak. The duo brave extreme oceanic conditions in their quest to test history. Somewhere near Baffin Bay, in the frozen expanse of western Greenland’s ice sheets, are two connected rivers. It’s a never-before-explored area that polar adventurers Sarah Mc Nair Landry, Erik Boomer and Ben Stookesberry have dubbed “Twin Galaxies.” The trio are true explorers, hauling sleds of gear and kayaks across 600 miles of glaciers and crevasses to be the first to run an Arctic river that they’ve only glimpsed on Google Earth. The 46-day expedition combines kiteboarding, skiing, camping and kayaking and is fraught with injuries, disappointments and frigid weather. 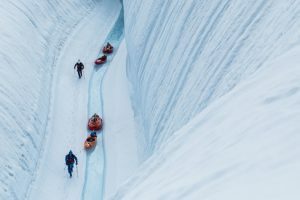 But their efforts are rewarded with stunning canyons of blue ice and the chance to paddle first descents of churning waterfalls that spit them out into the Arctic Ocean. 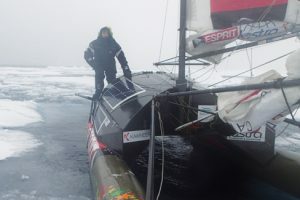 Après deux tentatives en 2011 et 2013, Sébastien Roubinet repart l’été prochain à l’assaut de l’océan Arctique à bord d’un voilier – char à glace de sa conception accompagné, cette fois-ci, de deux équipiers. Ce projet, qu’il prépare depuis de longues années, consiste à relier l’Alaska au Spitzberg via le pôle Nord : une traversée complète de l’océan Arctique en voilier entre eau et glace. Cette aventure, en plus d’être technique, humaine et sportive, leur permettra d’effectuer de nombreux prélèvements et mesures scientifiques. After two attempts in 2011 and 2013, Sébastien Roubinet will be back next summer to cross the Arctic Ocean with a sailboat – ice boat designed by him. This time, he will be accompanied by two crew members. 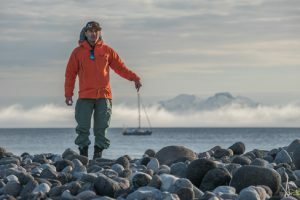 This project, which he prepars for many years, consists of connecting Alaska to Spitzberg via the North Pole: a complete crossing of the Arctic Ocean by sailboat between water and ice. This adventure, in addition to being technical, human and sporting, will allow them to make scientific sampling and measurements. 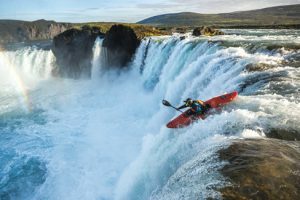 C’est une plongée dans l’univers du kayak de haute rivière à travers les paysages volcaniques d’Islande, aux côtés de 5 kayakistes français, Stéphane Pion, Louis Hétier, Mathieu Coldebella, Guillaume Fievez et Hugo Clouzeau. Leur objectif : parcourir cette île volcanique à la recherche de toutes les chutes et rivières sur lesquelles ils pourront pagayer. 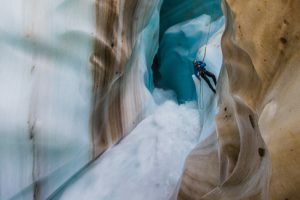 Four young climbers dream of climbing the Lotus Flower Tower, a legendary big wall, somewhere in the Cirque of the Unclimbables in the furtherst outreaches of Northern Canada. For 800 m of climbing, they will have to face 550 km of dangerous Nahanni river over a whole month of total independence. 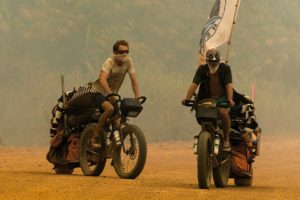 Given that they have only limited experience in this type of adventure, they persuade Dom, a seasoned traveller 33 years their senior, to help them get this expedition off the ground. Whereas Dom will be realising his teenage dream of riding the Nahanni rapids, he is also about to realise that the Lotus Flower will be his last ‘Big Wall’ climb. A poetic adventure of passing the baton between generations and a point where the dream becomes reality. Sophie Lavaud is part of this astonishing family of summits collectors of more than 8000 meters. She has already climbed five of the fourteen summits of the planet. 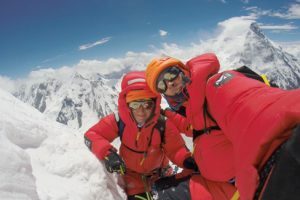 In 2016, with the director François Damilano, she tackles the dreaded K2, the second highest peak in the Himalayas, located on the borders of Pakistan and China. The film confronts the weight of hazard to the abnegation necessary for climbers to tread for a few moments the highest peaks. In 1973, the United Kingdom organized the first head to head sailing race around the world, inviting expert crews from Europe and other countries against each other. The Whitbread Round the World Yacht Race, today the prestigious Volvo Ocean Race took the sport to its limits. The British Royal Navy purchased six yachts to train 800 men and chose the best four 10-man crews for each of the four legs of the race, yet, an inexperienced Mexican man also signed up. In his fifties, with a crew that included his wife, son, family and friends. His name, Ramon Carlin. A weekend sailor. And despite becoming the laughing stock of the race and facing racism from the British press, he beat every competing nation. Au départ c’est une histoire entre amis. Des amoureux de la montagne… et des malvoyants. L’idée est de partager des horizons nouveaux, d’amener des aveugles et malvoyants au lac Baïkal puis dans les montagnes de Sibérie. Les compères parviennent à mettre sur pied leur expédition sur le lac gelé en plein hiver. Et là survient une incroyable alchimie. Les aveugles et malvoyants font découvrir leur perception, au-delà de la lumière, dans une formidable aventure humaine et de résilience. Un message d’espoir et d’optimisme, bien loin du handicap. Initially it is a story between friends. Mountain lovers… and visually impaired. The idea is to share new horizons, to bring blind and visually impaired people to Baikal Lake and to the mountains of Siberia. 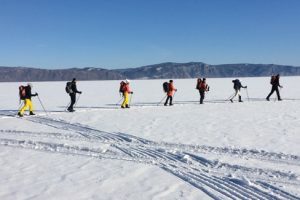 The climbing partners manage to set up their expedition on the frozen lake in the middle of winter. And then appears an incredible alchemy. The blind and visually impaired reveal their perception, beyond the light, in a tremendous human adventure and resilience. A message of hope and optimism, far from disability. Depuis trois saisons, Erwan Le Lann parcourt la planète à bord de son voilier Maewan pour une aventure unique de quatre ans entre mer et montagne qui unira marins et aventuriers de renom… Ce film retrace l’aventure exceptionnelle du skieur Adrien Coirier, du skipper Nicolas Boidevézi et du snowboarder Xavier Delerue, qui vont relier à la voile, et en hiver, le Japon depuis la Russie. D’île en île, ils vont être les premiers au monde à skier les volcans qui forment l’archipel des Kouriles. 3 seasons ago Erwan Lelann started a 4 years journey around the world onboard his sailing boat Maewan. 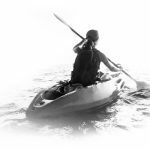 This expedition is a unique adventure involving famous sailors and adventurers to explore some of the most remote places of our planet between ocean and mountains. This movie traces the exceptional adventure of skier Adrien Coirier, skipper Nicolas Boidevézi and snowboarder Xavier Delerue who joined Maewan during winter to sail down from Russia to Japan. From islands to islands, they ski down volcanoes from the Kurils archipelago, a world premiere! In 2002, Louis Meunier, freshly graduated, decides to drop an all-set and predetermined career path and seek adventure in Afghanistan. He is amazed by the beauty of the country and the dignity of its people. 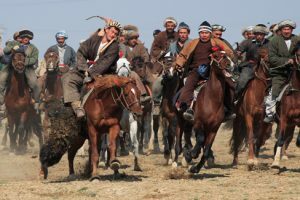 After reading the novel « The Horsemen » by Joseph Kessel, he dreams of attending a buzkashi tournament, the equestrian joust of the Afghan riders. Louis soon has only one idea in mind: find the horse of his dreams and participate in a tournament. Il y a 20 ans, Fabrice Gropaiz était venu au festival présenter son premier tour du monde en roller qui avait duré trois ans. Pour sa prochaine aventure, il a misé sur le skate électrique (une manette régit sa vitesse de progression) pour un tour du monde dont le départ est prévu en mai 2018. Une première avec ce moyen de transport original qui est un formidable passeport pour les rencontres. Afin de tester son matériel, il a réalisé cet été le premier tour de France en skate électrique, soit 3 000 km pour fignoler les derniers détails ! Twenty years ago, Fabrice Gropaiz came to the festival to present his first world tour in roller skating that had lasted three years. For his next adventure, he bet on the electric skate (a joystick governs his speed of progression) for a round the world whose departure is planned in May 2018. A Première with this original means of transport which is a great passport to meet people. 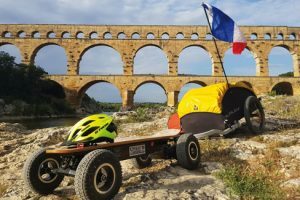 In order to test his equipment, he made this summer the first tour of France in electric skateboard: 3 000 km to finish the last details! Les pionniers Bertrand Piccard et André Borschberg ont fait le tour du monde à bord de leur avion solaire Solar Impulse 2 grâce à la seule énergie du Soleil. 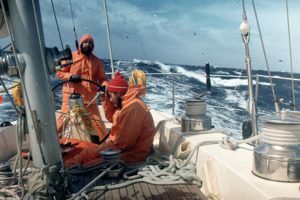 Ces 43 000 km au-dessus de cinq continents et de deux océans ont mobilisé une équipe de plus de 100 personnes chargées de veiller au bon déroulement de la mission. Digne de l’exploit du pilote américain Charles Lindbergh, qui relia New York à Paris sans escale et en solitaire en mai 1927, cette épopée humaine et technologique espère inspirer les politiques environnementales et la société de demain. Voir un extrait ici – Teaser. 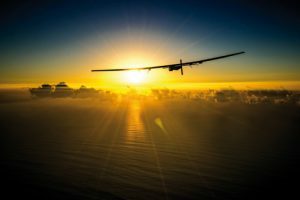 Solar Impulse is the only airplane of perpetual endurance, able to fly day and night on solar power, without a drop of fuel. After achieving the first part of the World Tour in 2015, Swiss pilots Bertrand Piccard and André Borschberg took off from Hawai in April 2016 to achieve the second part of their world tour via the USA with an ultimate goal: reaching Abu Dhabi in the summer 2016. The film tells the whole story of the Round the World Tour and the paths of its conceptors Bertrand Piccard and André Borschberg. Un périple de 6 mois, baptisé le Cinécyclo Tour, emmène Vincent et Yoro sur les routes du Sénégal. À coups de pédales, ils parcourent 3 000 km pour offrir une centaine de projections devant plus de 12 000 spectateurs à travers le pays. Électriquement autonome grâce à une génératrice à pédales, les séances de cinéma divertissent, amorcent, rapprochent et interrogent autour des thèmes de l’environnement, de l’avenir des hommes, des femmes, des villages, du pays. Mais cette aventure, aussi ambitieuse soit-elle, est d’abord une histoire d’amitié ! A journey lasting six months, christened the Cinecyclo Tour, takes Vincent and Yoro on a tour of Senegal’s roads. They cross 3 000 km, pedalling all the way, to put on a hundred films before more than 12 000 spectators throughout the country. Generating their own electricity via their pedal-powered generator, their film shows are both entertaining and thought-provoking, covering such themes as the environment as well as the future of men, women, villages and the country itself. But ambitious as it is, this adventure is first and foremost a story of friendship. L’écrivain Sylvain Tesson veut commémorer les cent ans de la révolution russe d’octobre 1917. Il part pour une aventure à travers les sommets du Tadjikistan dont les noms évoquent la révolution : Pic Lénine, Glacier Octobre, Pic de la Révolution, Pic Karl Marx. Il est accompagné de deux amis, l’écrivain Cédric Gras et l’ancien instructeur soviétique en alpinisme, Nicolay Taran. Le film raconte donc à la fois, une belle aventure dans un pays méconnu et la quête littéraire du prochain livre de l’écrivain qui s’intitulera Octobre Blanc. The writer Sylvain Tesson wants to commemorate the hundred years of the Russian revolution of October 1917. He leaves for an adventure through the Tajikistan summits whose names evoke the revolution: Pic Lenin, Glacier October, Peak of the Revolution, Pic Karl Marx. 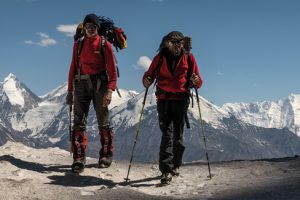 He is accompanied by two friends, the writer Cédric Gras and the former Soviet instructor in mountaineering, Nicolay Taran. The film tells then, at the same time, a beautiful adventure in a little-known country and the literary quest of the next book of the writer which will be called « White October ». Avec Christine Martin, adjointe au maire de Dijon, déléguée à la culture, à l’animation et aux festivals, Anne Quéméré, présidente du jury du film, Jean-Louis Gouraud, président du jury du livre et Olivier Allard, délégué général de La Guilde et du festival. With Christine Martin, deputy in charge of the festivities of the city, of the festivals and the attractive places of interest, Anne Quéméré, presidente of the film jury, Jean-Louis Gouraud, president of the book jury and Olivier Allard, CEO of La Guilde.